A Christmas family event organised by Newry Mourne and Down District Council’s Mourne, Downpatrick and Slieve Croob District Electoral Area Forums and its Policing and Community Safety Partnership along with the County Down Rural Community Network, Home Start and Sure Start, took place in the Burrendale Hotel, Country Club and Spa in Newcastle on Monday past. 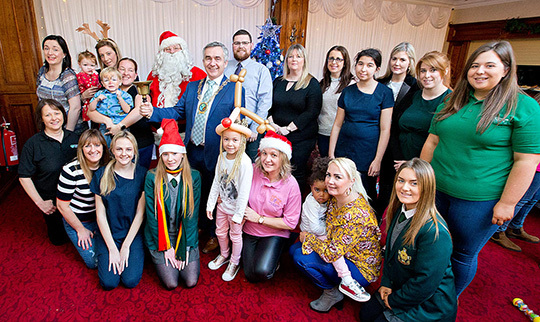 Local children and their families were treated to a morning of fun activities laid on by students from St Malachy’s High School and SERC and a visit by Santa Claus. Some of those who helped organise the event and some of the young guests are joined by Santa, Downpatrick DEA Cllr John Trainor and Council/Slieve Croob DEA Chairperson Cllr Mark Murnin.